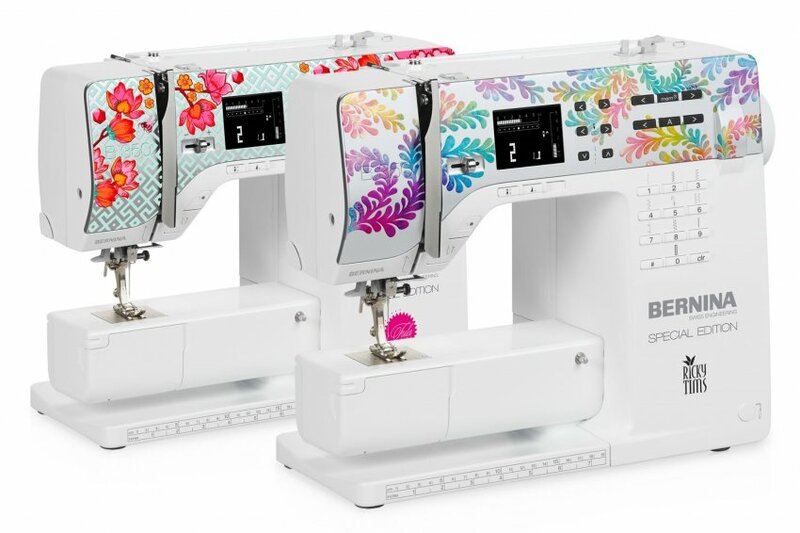 The two stylish special models in the BERNINA 3 Series set new design standards in the sewing machine industry and features the latest technology. Standard accessories for the new sewing machine include the large slide-on extension table, the practical Free Hand System (FHS) with presser foot lifter and walking foot, as well as two feet for quilting and patchwork. The B 350 Special Edition sews a variety of fabric types with ease, as well as neatens and embellishes. Two sewing alphabets are available. Should your requirements grow, the model can be upgraded with a wide range of optional accessories. The vertical spring presses the foot securely to your project, preventing the fabric from riding up with the needle (flagging). The material therefore lies flat while it is being sewn, allowing you to produce neat, consistent stitches. For even greater sewing ease, Quilting foot # 29 features a clear sole, affording you a perfect view of both needle and stitching area at all times. The BERNINA 350 SE makes room for your personal creativity: its memory offers space for the permanent storage of up to 30 stitch-pattern combinations. This means you needn’t reprogram your personal stitch-pattern combinations each time – the long-term memory of the 350 SE ensures that they’re immediately available the next time you turn on your machine. The direct-selection keys let you access the saved stitches in no time flat – this saves time and increases your enjoyment, allowing you to reuse your own personal favorite combinations or most frequently used stitches effortlessly and whenever you feel like it. This memory functionality of the BERNINA 350 SE offers a premium touch that is by no means a given in entry-level models – Swiss quality, designed with attention to detail. One of the most compelling arguments in favor of the BERNINA 350 SE is its extensive stitch library: 85 pre-programmed stitches, making the 350 SE a versatile precision tool. The direct-selection function and modern, bright LCD display allow you to switch between different stitch patterns in a matter of seconds. With 20 utility stitches, two buttonhole stitches, a full 52 decorative stitches, and 11 quilting stitches, the BERNINA 350 SE is an outstanding choice for everyday mending jobs and alterations, as well as creative sewing and quilting. The simple, intuitive handling, first-class functionality, and solid construction of the BERNINA 350 SE ensure that you will continue to enjoy working with this machine for a long time to come – even when you make the transition from simple to more demanding projects. The BERNINA 350 SE counts among its features a free-arm extension table enabling you to increase your work area quickly, affording you greater ease when sewing, and allowing for optimum control in guiding your project. Together with the bright LED sewing light, this provides you with the perfect view of your project. Large-format projects in particular can be handled effortlessly – and once you are done, remove the BERNINA 350 SE’s extension table with the push of a button to return to free-arm sewing. The automatic buttonhole function gives you perfect results in no time flat. The BERNINA 350 SE gives you a choice of two permanently programmed buttonhole styles to ensure that even beginners simply and nearly effortlessly achieve optimal results that will stand up to the most critical scrutiny.